Stories are a powerful way to help your audience understand and relate to your message. But how do you illustrate your story? You don’t always have to — you can black out the slide and just talk. But let’s say you want to illustrate your story. We need to upgrade the skills of the people in our IT Department. We know that students access their school records on their smartphones more than on their computer. The parts of our website that let our students access their courses isn’t optimized for smartphone use but our IT Department hasn’t learned to do this. They’re tried but the result has been frustration. So we need to get them some training. How do you illustrate this story? 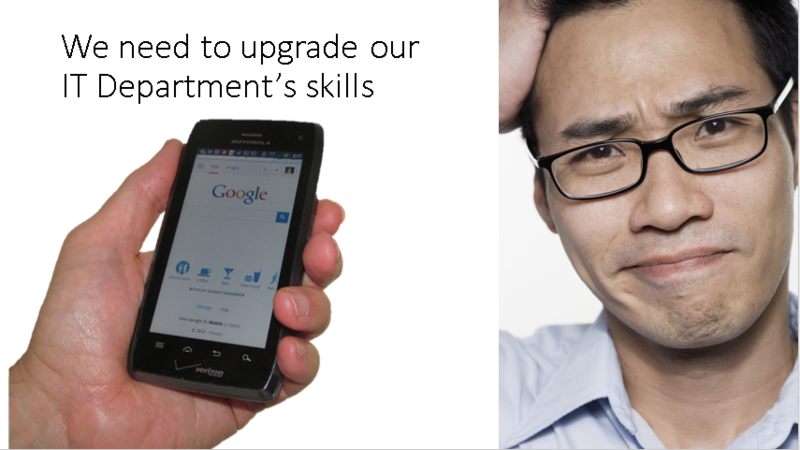 The 2 major points are that students are using smartphones and the IT Department is frustrated. So you can create a simple slide like this. The only problem is that the second image, the frustrated man, gives away the ending! When you illustrate a story, you want the images to appear at the right time. This sets up a little anticipation that keeps the interest of your audience. In a storybook, you turn the pages to reveal the next part of the story and you could put the second image on a second slide. But another way is to simply animate the frustrated man to appear at the right time. You do that by adding an Appear or Fade animation and leaving the default setting that starts the animation when you click. So when you get up to the part about the frustration, you click and the image appears. In PowerPoint 2003, choose Slide Show, Custom Animation. In 2007, click the Animations tab and click Custom Animation. In 2010, click the Animations tab. In 2003 and 2007, in the Custom Animation task pane, click Add Effect, Entrance, Appear or Fade. If you don’t see the option you want, choose More Effects. In 2010, click Add Animation on the Animations tab, then choose Appear or Fade in the Entrance section. Have you illustrated a story in this way? Can you think of a use for this technique? Thanks so much for the tips! Your writing is so clear and concise, and I really like that you post for people of all levels of knowledge. There are some nice, iconic-like graphics that can easily be downloaded and inserted into your slides. And they are royalty-free. It’s worth checking out if you need something quick and easy to help with an illustration. Very nice post. You are absolutely right.